On this day in 1721, Jean-Antoine Watteau died. Watteau's life and career were short and he was little known or celebrated during his lifetime but since his death at the age of 26, his reputation has flourished. His influence was felt far and wide as the years grew on and he even loaned his name to Watteau pleats, one of the defining characteristics of the sack-back gowns that appeared so frequently in his work. 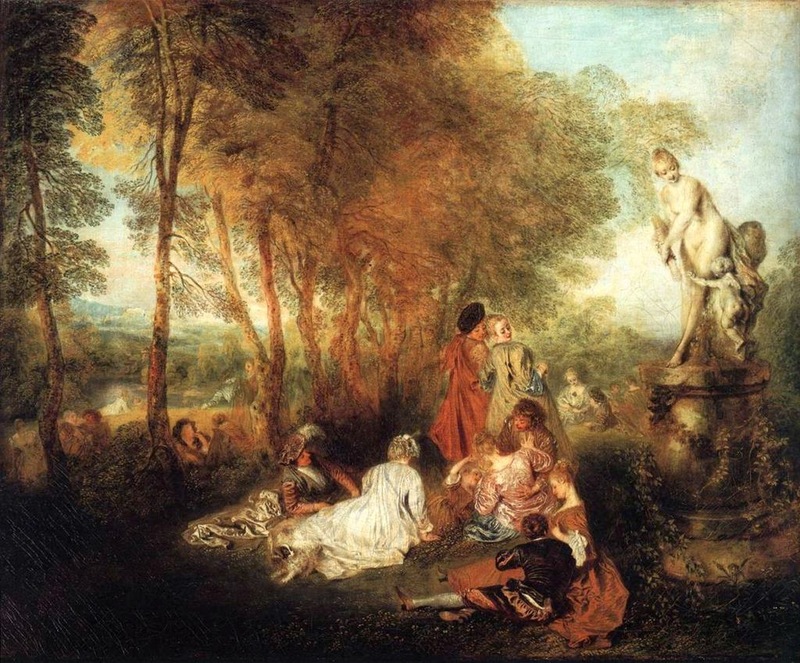 My favourite painting by Watteau is his 1717 work, The Festival of Love, a wonderfully evocative scene of pastoral festivities and romance, watched over by a statue of Venus. The rich, rolling landscape extends as far as the eye can see and couples walk, chat or generally spend time together, with a child at the centre of the canvas. Unlike the formal portraits in which a pose is held, grand and poised, to create a permanent and lasting impression, here Watteau has captured a moment, a second between friends or lovers. It is the stuff that rose-tinted memories are made of, days long-since passed with a gentle warm hue when anything seemed possible. Viewing the work with the benefit of centuries, we are left with a picture perfect depiction of a world that fascinates and attracts, an idealised place long since gone if indeed it ever existed at all. I like this painting...it just captures a delightful moment in time. It feels as though you could just step right into it! Engraving copies of Watteau's paintings also influenced mid-18th century Portuguese tile mural designs. I reference Watteau's work in my forthcoming novel CUT FROM THE EARTH. Thank you for this post. Ooh, I like the sound of that, keep us posted on publication dates! Looking at all the beauty, one wonders if it came from the imagination or if, once upon a time, the world looked like that. I hope it is the latter, but suspect the former!